A worker arranges a display of cheeses, including imported products, at the delicatessen counter of an Azbuka Vkusa OOO, which translates as 'Elements of Taste,' supermarket at the Neglinnaya Plaza shopping center in Moscow, Russia. 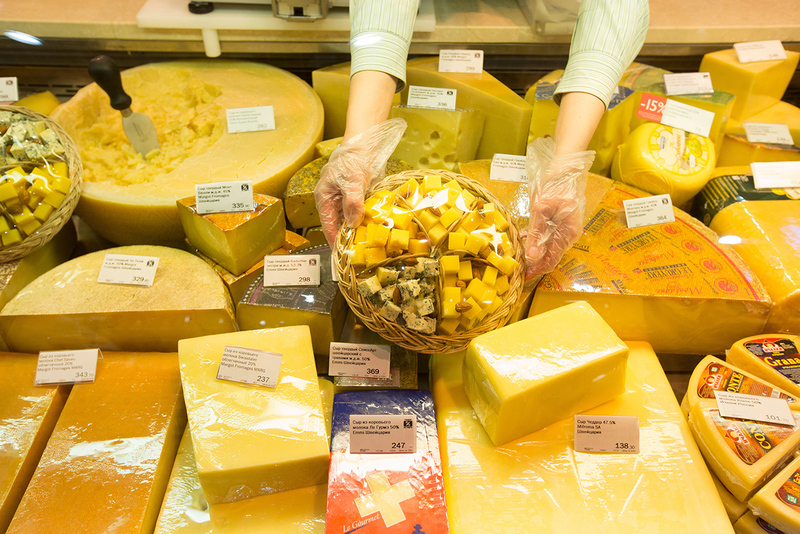 Despite sanctions Russia has plenty of Italian Parmesan cheese, French brie, Spanish jamon and Dutch blue cheese. RBTH investigated to find out who sells these items on the Russian market, and how. In an effort to end illegal imports of food products banned under sanctions, Russia will impose fines on anyone transporting, storing or distributing food products that come under the embargo introduced in 2014. Russia's agriculture watchdog, Rosselkhoznadzor, proposed this measure on Feb. 1, but experts say the proposed fines won't have much effect because suppliers have already found ways to circumvent the ban, and fines won't deter them. Besides, significant amounts of banned goods arrive in Russia in shipments addressed to individuals and the new measures do not apply to them. "There are many schemes in Russia to secretly import banned foodstuffs, therefore the Rosselkhoznadzor initiative won't have much of an impact," said Denis Frolov, a partner at BMS Law Firm. The situation is unlikely to change "even if the question of introducing criminal charges for violating sanctions is raised," concurred Maxim Tafintsev, a senior partner at Maalouf Ashford & Talbot. "By law, any Russian citizen can bring into the country for personal use up to five kilos of banned food products and they don't have to carry them; they can send these items to themselves through the post office," said 29-year old Muscovite Marina Bezrukova (the name has been changed), who owns a small internet shop selling Italian food. "The trick is that instead of you, your business partner in Italy, for example, can post a parcel for you, fill in a declaration at the post office in your name and put in your passport details, and you will receive it as if you had sent it." "My Italian husband lives in the city of Reggio Emilia where Parmesan cheese is made," added Marina. "This is where he buys it and then sends it to me by post." To start a business, Marina opened a Russian-language website using an international domain and advertises through acquaintances. At the same time, Marina's husband has registered his business in Italy and officially pays a 40 percent tax on revenue. The price of Parmesan, when resold, increases by between 100 percent and 200 percent as this includes not just the seller's margin but also the delivery by post and taxes, said Marina. In St. Petersburg, thanks to the nearby Finnish border 120 miles away, there is also a popular scheme for smuggling banned products from Finland. On the Russian social network Vkontakte there are many groups with names like "Cheese from Europe," or "Ham from Spain" whose owners deliver goods using coach tours to Finland. "A group of tourists is formed, which then buys the goods and brings home the maximum luggage allowance of 110 pounds per person," said 28-year-old Anton Belyayev (the name has been changed), who is the owner of a group selling cheese on Vkontakte. For acting as a courier for the banned products, Anton covers the tourists' cost of travel, in full or in part. Anton doesn't have a registered business and doesn't pay taxes. In addition to selling products via social networks, he also posts advertisements on the Avito website. Large consignments of banned products for restaurants and hotels are often imported directly from the countries of the Customs Union, such as Belarus and Kazakhstan. "Officially, food products that travel between our country and these countries are not subject to customs inspection," said defense lawyer Maxim Tafintsev, adding that even after Rosselkhoznadzor made sure that cargoes imported from these countries are inspected, the volume of banned imports still remains very high. Crafty people often alter codes in customs declarations and present banned products as ones that are allowed, said lawyer Denis Frolov. After Crimea became part of Russia, it moved to the Russian customs system but that has not yet been fully set up, said Tafintsev. Also, Crimean border guards do not have sufficient resources to inspect cargoes. "For the time being there is no ban on imports from Ukraine to the Republic of Crimea. Therefore all sorts of goods, including banned ones, can arrive in the region and then travel throughout Russia," said Tafintsev. It’s quite difficult to monitor the movement of transit goods and food products across Russian territory, so a transit scheme is used. "Goods go from Europe to say, Uzbekistan, via Russian territory, but the goods never arrive at their destination country and are 'lost' in Russia," said Frolov. Food products from some European countries, for example Switzerland or the Republic of San Marino, officially are not embargoed and can be exported to Russia. "Food products from countries under sanctions are taken to Switzerland where official labels are switched and banned products arrive in our country as if they were Swiss," said Tafintsev, adding that re-export to Russia is also popular in Belarus.